shooting style to USC next year. His artful jumper possessing a quick release, pin-point accuracy and goose-neck ending, Sead Odzic is certainly known for his superfluous ability to rip apart basketball nets. But his progressive abilities have carried the native Montenegrin far across the typically labeled spot-up shooter tag. "Sophomore year, no one really knew about me. That was probably the easiest year for me." When Jarryd Loyd, the starting point guard for the last three years at Niles West, moved on to Valparaiso last year, the opportunity for Odzic to elevate his game was there. Now, with a full athletic scholarship to the University of Southern California, Odzic, a short-term thinker, never predicted his current success with modest beginnings. Sead’s family left Montenegro when he was 4 because of religious fighting and escalating violence. He moved to Chicago with his mom, dad and younger sister for one year before they left to their current residence in Skokie. While a lot of Sead’s relatives were stuck in Montenegro, his family was able to move out because his father lived in the U.S. for about 10 years before Sead was even born. Speaking broken English, Sead’s father is a landlord of two apartment buildings in Chicago where he is constantly working, always tending to the needs of his tenants. “Just a lot of hard work, that’s how he gets by,” Sead said. A bilingual speaker, Serbian is not the only thing Sead learned from his father. 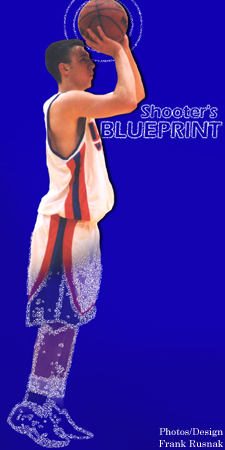 It is also where his foundation for a solid work ethic on the basketball court was derived from. All of his 6 a.m. shooting sessions at the gym have paid off. As a freshman at Niles West, he came off the bench the first two games then was a permanent starter on varsity averaging about 10 points a game. “As a freshmen he had great court awareness and he just handled himself like he was a senior and you knew he was going to be something special,” Genis said. After a freshman season in which he called a good learning experience, he helped Niles West to a surprising 23-6 season during his sophomore campaign where he exploded to the tune of 20 points a game. Then, with Loyd and Odzic both upperclassmen, the Wolves upped their schedule, but fell short of their lofty preseason goals. This year, in his final season, Odzic has morphed his game. Outside of inheriting the majority of the point guard duties now that Loyd is gone, Odzic has taken to the leader tag quite well. He ended the season averaging 20 points, five rebounds and four assists for a team that lost in the regional finals to St. Pats. That final game was representative of how the entire season went, Odzic said. Senior jumping-jack Jackie Hunt and junior bruiser Victor Colon were the only players, along with Odzic, who would try to establish themselves for Niles West all year. Against St. Pats, those three were the only ones who scored for the Wolves. “Basically that whole year we were looking for that fourth guy to step up but it never happened,” Odzic said. Individually, Odzic garnered all-tournament honors at the Pontiac Holiday Tournament and ended as a three-time all-conference selection in the Central Suburban League. It was his efforts last summer with his summer team, the Illinois Wolves, however, that landed him the full ride to USC. When Odzic signed with USC, Henry Bibby was the coach before being fired four games into the season. Now, Odzic is still committed to the Trojans and content with new boss Tim Floyd at the helm. “He’s a real nice guy and I’ve got to come and work for a job,” said Odzic of the former Chicago Bulls coach, who has yet to see his recruit in person. Floyd was able to watch Odzic on April 16, as he was added as a late addition to the Chicago versus New York all-star game which was broadcast on television. But it will take more than game footage to show how Odzic affects a team and the type of player he is off the court. “He’s a lot of fun for us,” Genis said. “He walks into the gym and he just lights up the gym. He’s a wonderful kid and we are going to miss him; not just on the basketball team but as a person.